The GEO continually investigates landslides to learn. They are not ruled by a “GP WPKL 2010” and pass the buck to developers and geotechnical experts, nor do they shunt involvement of the public. In fact, since the mid-1990, landslide risk assessment has become a factor in developments on hill slopes. They recognized that conventional deterministic approach of slope stability analysis for slope design was inadequate and not holistic enough. Hong Kong practises landslide risk management. This comprises an estimation of the landslide risk, deciding whether or not the risk is tolerable, exercising appropriate control measures to reduce the risk where the risk level cannot be tolerated. Implicit in this are human lives! Essentially, they do not rely on just 2 geotechnical experts to do away with buffer zones. In fact, in some cases debris resisting barriers and statutory repair orders are imposed. Most importantly, the Hong Kong authority recognizes that residents next to hill side developments are stakeholders. They reach out to communicate and facilitate partnership with them. DBKL and Federal Territory Ministry appears to think residents need not be involved nor should they be concerned. Hence, it is not surprising that the Real Estate and Housing Developers’ Association and certain developers are jumping for joy at the prospect of working with GP WPKL 2010. Records show that Kuala Lumpur (19.2%) and Selangor (16.6%) are the most landslide-prone areas, followed by Perak (13.4%) and Pahang (12.3%). Kuala Lumpur has the highest landslides record. A lot more can be found on the internet that requires DBKL and Federal Territory Ministry to explain how they have put People First in putting forth GP WPKL 2010. In earlier articles, questions on how DBKL can be exempt from National Physical Plan (NPP) policies have been raised. The Prime Minister is the chairman of the National Physical Planning Council. Should he not be concerned that the Mayor of Kuala Lumpur considers the NPP as irrelevant in the Federal Capital of Malaysia? Bukit Gasing residents have a right to a public hearing to understand how DBKL and various agencies have taken care of their safety. Kuala Lumpur residents should be concerned at how they are being disenfranchised by DBKL through GP WPKL 2010 and their rejection of Town & Country Planning Act 172 as applicable in KL. The Mayor of Kuala Lumpur, DBKL officials and representatives of Board of Engineers Malaysia herald a new era for hill slope development and safety on the 22nd September 2010. The panacea against landslides caused by man’s encroachment on steep hill slopes will be the GP-WPKL 2020, the hill slope development guidelines that will apply to Kuala Lumpur. Under this new hill slope development guidelines previous prohibition of development on class IV (≥35° gradient) slopes is removed and class III (≥25° to 35° gradient) slopes can be freely developed. An independent checker was stated in the new guidelines as a second geotechnical expert (with five (5) years experience) paid for by the developer. However, the Mayor also stated that IKRAM will be the “independent checker”. So, what is the truth? IKRAM have often been quoted by DBKL as “experts” with geotechnical expertise. It stretches imagination to suppose that it would be adequate to ensure stringent and safe geotechnical standards will be enforced. Do visit IKRAM website and make your own assessment. Was IKRAM not involved when Medan Damansara (Damansara 21) development was approved? The Board of Engineers Malaysia (BEM) stated that they have established an Accredited Engineers membership (registration stated in 2007) for Geotechnical Experts. A check on this revealed that there are only 13 accredited engineers. I also note that none of them are associated with IKRAM. In general worldwide, the course curriculum on slope engineering for undergraduates is centred on slope stability analysis with minimal coverage on other important aspects of slope engineering. Geotechnical engineers and geologists are normally trained on the job by in-house senior staff. Hence, the approaches adopted by different agencies and private entities such as the local authorities, Minerals and Geosciences Department (JMG), JKR and Kumpulan IKRAM also vary in the aspects of planning, approval, design, construction and maintenance of slopes, emergency preparedness, response and recovery. Given the above state of geotechnical skills availability, is it too much to question the sincerity of DBKL and its commitment to safety of residents affected by DBKL’s decision to give a charter to developer to attack hill slopes and destroy the already scarce green lung in KL? Kuala Lumpur residents should be very concerned. The High Court (Judge Aziah bte Ali) in agreeing with DBKL and Gasing Meridian to deny residents and NGOs the right to public hearing seem to have emboldened DBKL to announce the GP WPKL 2020, thereby giving a charter to developers to develop hills. What is happening to Local Agenda 21 in Kuala Lumpur? DBKL’s announcement of the hill slope guidelines (GP WPKL 2020) 22nd Sept 2010 puts into jeopardy the vision of Kuala Lumpur Structure Plan 2020 to transform KL into a sustainable and livable city. It is well known that sustainable and livable cities must balance the interest of business and living environments. A key measure of this is a city’s regard to providing “Open Spaces” and encouraging the creation, extension and conservation of public parks and nature reserves. DBKL’s choreographed presentation of the GP WPKL 2020, with supporting cast from the Institution of Engineers, Malaysia (Geotechnical Eng. Division), highlighted that the solution to residents living under threat of a man-made time bomb of landslide disasters need fear no more. DBKL and various agencies and experts had considered the hill slope safety standards of Hong Kong, Singapore even Korea. They (including the geotechnical engineering profession) are convinced that with the new guidelines, residents should now trust the experts. To ensure hill slopes safety standards are kept high, there has to be an “independent checker”, appointed and paid for by the developer. The “Best Engineering Practices” shall be employed and all manner of geological studies has to be submitted before approval. The “Factor of Safety” index (FoS) that shall apply will be 1.5. Apparently, Hong Kong only uses maximum FoS of 1.4. IEM representative cheered the wisdom of the Mayor of KL. Given the wisdom of such measures, buffer zones and setbacks on buildings on hill slopes developments can be reduced from previous hill slope guidelines and the Selangor State Government’s proposed larger buffer zones are no longer needed. There is no longer the need to prohibit development on Class 3 (≥ 25 deg.) and Class 4 (≥35 deg.) gradient hill slopes. The Mayor stressed that landowners have a right to develop their land for profit and KL needs the property development industry to prosper. If DBKL were to succumb to irrational fears of residents against steep hill slope development and demands to provide world class open space requirements (e.g. as stated in the National Physical Plan for Malaysia), it could cause DBKL 7 billion ringgit. In case you are too busy to explore the websites above, the vision of “little red dot” (a land starved nation) to support a sustainable and livable City is to increase the green park space by 900ha to 4,200ha by 2020, and reach a park provision of 0.8ha per 1,000 population by 2030. The yet to be gazetted Draft KL City Plan Open Space target for 2020 is 1.1ha per 1,000 (with the inclusion of some 25% of this being “private open spaces”. So, will the GP WPKL 2020 facilitate or further undermine the Open Space target of the DKLCP? DBKL is already in breach of the target of 2ha per 100 Open Space set by the National Physical Plan. KL residents and others affected by DBKL decision should pray that the blessings of such wisdom don’t turn to mud (literally). Victor Oorjitham and Gary Yeoh were invited to BFM radio for a live interview on Monday (20th Sept). We are grateful to BFM radio for giving us the opportunity to share our views on Gasing Meridian’s proposed development on the steep hill slopes of Bukit Gasing. The issues surrounding the handling of proposed development on Bukit Gasing by Federal Territories Ministry and DBKL are many. We hope we have provided some useful information on how DBKL lacks both the sensitivity and commitment to our government’s stated policy of One Malaysian, People First, Performance Now. When authorities ignore our rights to a safe, sustainable and livable environment, dare we remain silent? Bukit Gasing residents, Victor Oorjitham and Gary Yeoh will be on BFM radio on Monday afternoon. We would like to inform BFM listeners on the safety issue of hill slope development in and around Kuala Lumpur. We also hope to highlight our plight and our conviction that we have a right to be given a public hearing by DBKL. Hill slope safety is a cause for concern to all Malaysians. AS a resident of Maxwell Towers, I would like to respond to the disingenuous letter from Zhang C.G. on Sept 14. Our judicial review was on our right to a public hearing before City Hall can issue development orders to Gasing Meridian Sdn Bhd, and whether approvals issued were consistent with development guidelines. It is incredible that deaths resulting from the Highland Towers (1993), Hillview (2002), Kampung Pasir (2006) and Bukit Antarabangsa (2008) tragedies could be written off as “the few unfortunate landslides”. To compare our fears for our lives and homes to a demand to close highways is just ridiculous. Mainstream media have reported 141 deaths resulting from landslides caused by development from 1993 to 2008 in Peninsular Malaysia. Were these testaments of the safety our hillslope developments and the local authority’s diligence in ensuring safe and sustainable development? Comparing the safety of hillslope developments in Hong Kong to what prevails in Malaysia is laughable. Hong Kong has a government-funded Geotechnical Engineering Organization (GEO) dedicated to hillslope development safety. Hong Kong created GEO in 1977 to identify unstable hillslopes, repair them and ensure that high standards are kept on hillslope developments. We have DBKL approving the Damasara 21 development at Medan Damansara that resulted in the collapse of a retaining wall, causing significant damage to two homes in August 2008. We have hillslope developments designed by developer-funded consultants, building contractors whose reputations are suspect, and woeful monitoring of their construction by agencies. Datuk Prof Dr Ibrahim Komoo had said on NTV7 in Nov 2006: “If there were to be any building (reference to the proposed site), it is likely to cause a tragedy”. The landslides at Bukit Gasing at the Siva and Sri Maha Kaliaman temples in 2007 and March 2010, respectively, showed the wisdom of his comment. In addition, independent studies by the Department of Geology, University of Malaya and Geological Survey Malaysia had highlighted that the natural constitution of Bukit Gasing is not suitable for any sort of building development. We are not a bunch of crazed lobbyists fighting for green lung preservation, nor are we denying landowners their rights. 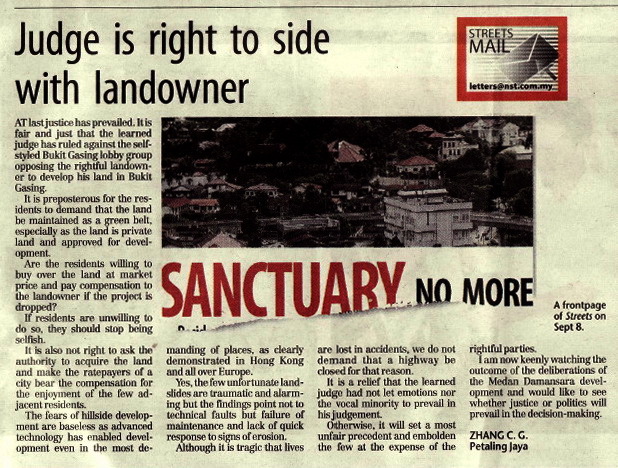 We seek only for DBKL to recognize our right to be heard and for DBKL to provide information on how the proposed development on Bukit Gasing is safe and sustainable as provided under the Town & Country Planning Act 172 (TCPA) and approved in accordance with guidelines for hillslope developments. The TCPA (amendment) Act 2001 (Act 1129) sought to bring consistency to town and country planning in Peninsular Malaysia. It also implements the role of the National Physical Planning Council (chaired by the prime minister) in ensuring that the national policy for sustainable development and town and country planning matters is followed. Developers and landowners’ rights cannot rest solely on their rights to profits. The public’s right to safe developments on hillslopes and the development’s impact on the natural/living environment are equally important. If these were not so, why bother with having planning authorities? The older Sivan temple started renovation plans about five years ago but work has been suspended, leaving the temple in a limbo. It was not an easy project to begin with – there is insufficient flat land on which to build. Extensive foundation work is required and the works are often blamed for any landslides that occur in the vicinity, be they true or otherwise. The Sri Maha Kaliamman temple located below experienced several landslides which damaged parts of the temple and fortunately no one was hurt in any of these incidents to date. Gasing Hill is part of range of hills which includes Kerinchi and Pantai hills. This range is also a boundary between Kuala Lumpur and Petaling Jaya. Communities around Gasing Hill are often at loggerheads with the Kuala Lumpur City Hall (DBKL) due to the latter’s willingness to approve hillside developments. The courts recently ruled that DBKL is not obliged to hold a public hearing on a proposed development at Gasing Hill. The Petaling Jaya side remains relatively untouched and is considered one of the few green lungs left in the city. Properties built here were limited to those at the foothills and below, forming the bulk of Section 5. Gasing Hill is apparently a gazetted forest reserve. It is a secondary jungle and was formerly a part of a rubber plantation. There are several jungle trails here which connect the five peaks found in this range. It is literally a jungle within an urban jungle! A tree have fallen across Jln 5/60 due to strong winds early this morning (approx 3am), a closer look at the photo will reveal how steep the slope is. Forces of nature may from time to time cause trees to fall. However, vegetation and root systems will hold the soil in place as evidenced by lack of erosion. Conservation management will further sustain the beauty of the our enviroment and its sustainablity. Man’s wanton development for profits thwart nature’s means of keeping steep slopes safe. Do you wish to rely on planning authorities and developers assurances of retaining walls and man-made drainage (frequently not maintained and poorly designed)? Remember Medan Damansara, Bukit Antarabangsa, Ulu Klang and Amanah Raya. COMMENT Usually people learn from tragedies. But it’s just the opposite in Malaysia. Here the government and its departments and ministries are well known for their tangos with danger, not to mention disaster. 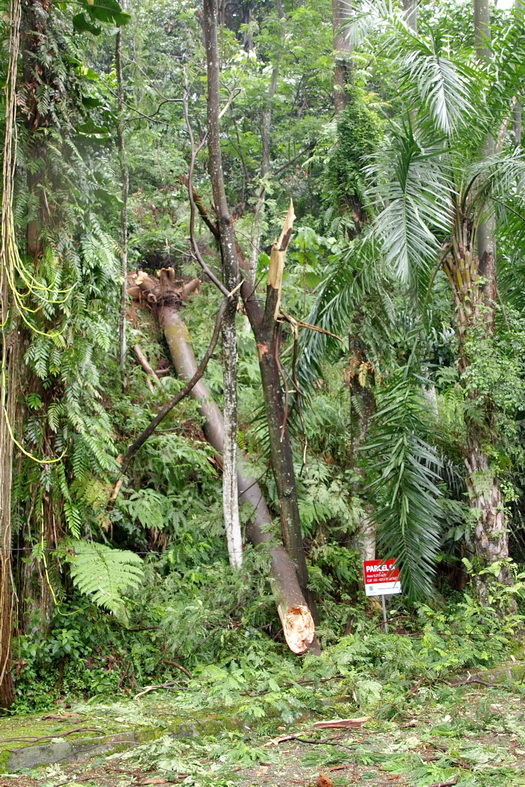 The latest on its list is the controversial development project in Bukit Gasing. 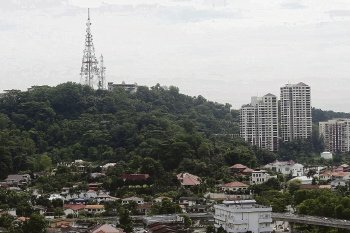 The recent High Court judgment throwing out the application by 108 residents for a judicial review to challenge the development order issued by the Kuala Lumpur mayor means Gasing Meridian Sdn Bhd can now continue to build 70 bungalows on a 15.5-hectare site in Bukit Gasing, amidst protest by residents who fear their safety. But in her judgment, High Court judge Azizah Ali said the proposed building site is private land and not one that was earmarked as a green lung. She also stated the Federal Territories Planning Act 1982 applies to the development and therefore, the residents would not have the right to be heard on the development – unless it falls within the rules under the Town and Country Planning Act 1976, which did not apply in this case. But this case simply cannot be about the law and jurisdiction as it raises important questions of the planning policies of City Hall, involves the lives of thousands of residents and is clearly an environmentally risky project. For example, although freedom of expression is guaranteed in the Federal Constitution, various policies including the Police Act are frequently used to clamp down on peaceful gatherings. My question is simple – if various laws can be used to curb legitimate dissent in the country, why can’t other merits of the case be taken into consideration before a verdict is delivered? 49 percent of the said land, however, consists of slopes measuring 26-35 degrees or higher while 37 percent of the slopes are between 16-25 degrees. Bukit Gasing is also highly susceptible to land erosion due to its soil composition. And, Malaysians have no faith in the planning authorities due to their complacency when it comes to implementing controls to ensure safe development. 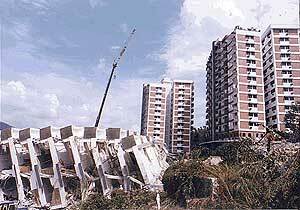 The Highland Tower collapse (below) and the Bukit Antarabangsa disaster have not been forgotten. Images of the dead and decomposing bodies, pain and anguish of mourning relatives are yet to be wiped off our memories. Let’s now look at some statistics – over the last 15 years, at least 14 major landslides occurred in Peninsular Malaysia alone that led to the death of 68 persons. If this is not frightening enough, one landslide occurred in March 2007 after renovation work was carried out on a Hindu temple on Bukit Gasing. On Jan 5 the following year, another landslide occurred, near the same temple. Both the developer and City Hall have not entertained residents’ requests for copies of the soil and other tests that allegedly prove Bukit Gasing can be safely developed. As such, I urge the City Council to hold a public hearing to enable the residents to air their concerns on the environmental and safety issues concerning the project. The City Council should exercise complete transparency and not perceived as engaging itself in back door deals with the developer to push through the project. Charles Santiago is member of Parliament for Klang. It is with great regret that the High Court has rejected the people will’s to be heard over a controversial development on Bukit Gasing. The writing is on the wall for this development. There will be blood on their hands be it the judge who rejected the people’s application, the Kuala Lumpur mayor (as the servant of the rakyat), the developers and also those potential buyers of this controversial development. No matter how much has been said about preserving this pristine green lung, money and greed makes us all blind including all of those mentioned above. Bukit Gasing is among the few pristine green lungs left in Kuala Lumpur. For decades the debate has been whether it is safe to build on this hill.